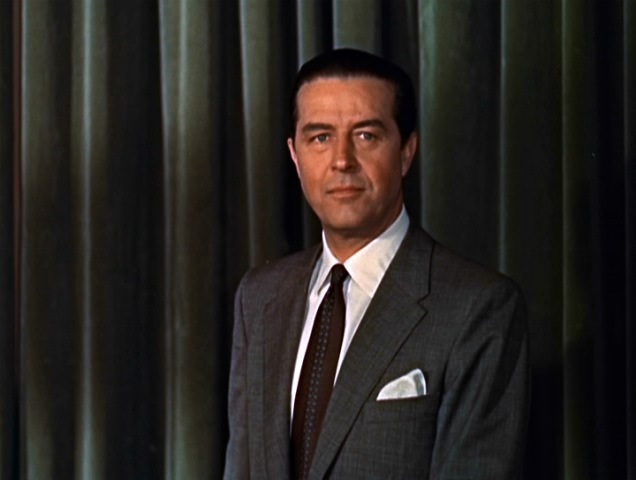 At times, Tony Wendice, the would-be perfect murderer, poses as if for a portrait in front the green velvet curtains, occasionally whipping them open and shut with grave theatricality. This is the second installment of a three-post series about Dial M for Murder. For Alfred Hitchcock, long before there were movies, there was theater. The stage was his first love – and his passion for it persisted throughout his life. As early as his backstage whodunit, Murder! (1930), Hitch was contemplating the nature of theater in the context of film. 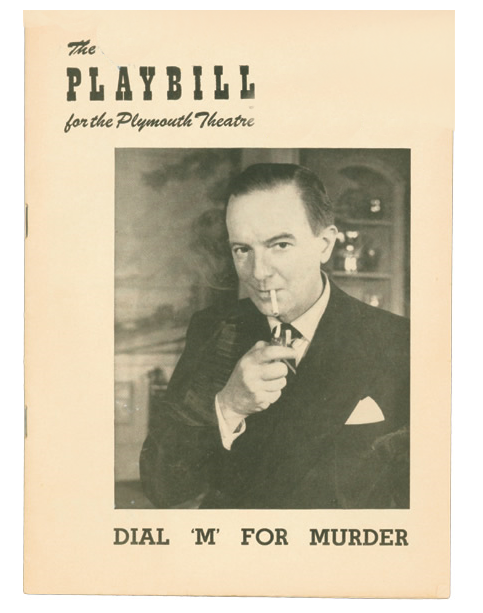 Thus, when he adapted Frederick Knott's hit play Dial M for Murder for the screen in 1954, he drew on decades of memories and thoughtful consideration about the differences between the playhouse and the movie house. And, though he knew the technique was a flash in the pan, he saw the 3D process as a way to try to reconcile those differences. Original Playbill from the 1952 Broadway hit starring Maurice Evans as Tony Wendice. 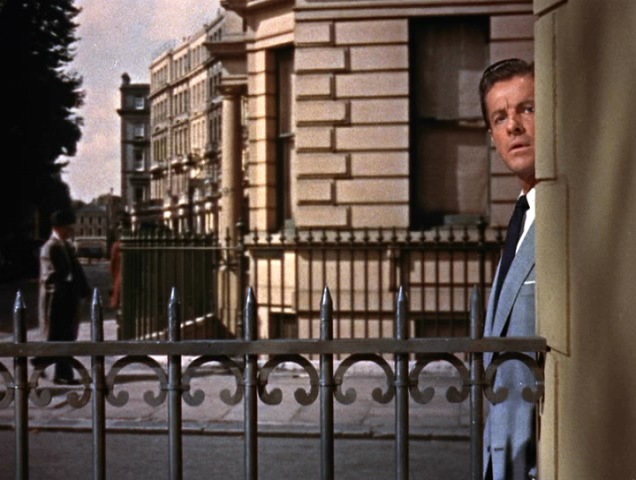 One of of the more obvious contrasts between film and theater involves staging and composition. In cinema, the camera can focus beyond foregrounded objects, drawing viewers to a desired focal point in the background. Theatrical directors don't have that option and must use lighting to move audiences' attention around the stage. Lacking film's depth of focus, actors or props that are closest to the audience usually command the most attention as well. Interestingly, the same goes for 3D film: it too pulls the eye toward whatever object is in the foreground. What's more, technical limitations of that first generation of stereoscopic cameras rendered close-ups – another uniquely cinematic device – next to impossible. In those two areas at least, 3D movies resemble theater more than they do their 2D counterparts; looking at it from this technical standpoint, almost seems inevitable that, when pressed to use the short-lived technology, Hitchcock would shoot a play. Hitch knew that, as in the theater, the foreground space is paramount. That's why he put the scissors there. Hitchcock must have had a ball lighting this film. 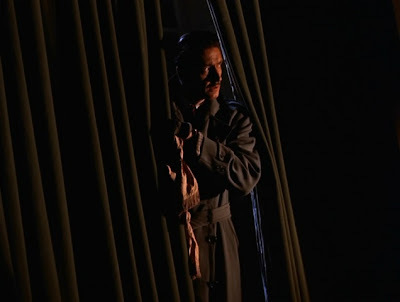 He often credited the great German film makers for their influence on him, and the lighting in Dial M is a throwback to that early dramatic style, as well as to the stage itself. 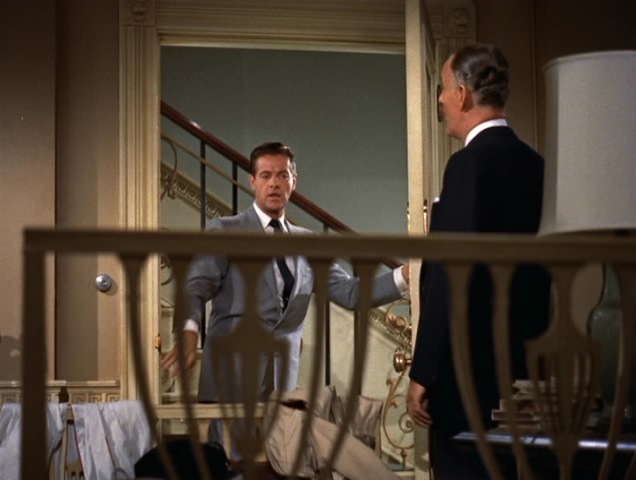 I'd even go so far as to say that the lighting in this movie is the most Expressionistic of all his color films. As late as the 1960s, Hitch complained that lighting for color film was a problem not yet solved, but to my eye, this movie comes awfully close. Campily operatic, the lighting in Dial M takes its cues, not from nature, but from the theater. 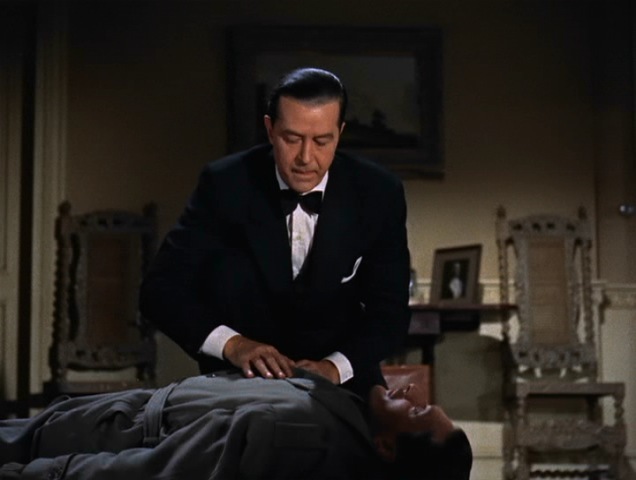 Note how Tony is illuminated as he searches Lesgate's shadowed, lifeless body for the latch key. But then the camera swings around to include Margot searching her purse, her white nightgown now dominating the frame and our attention, as we identify with Tony's fear that she will discover that her key is missing. The lighting and camerawork are so expressive that you can turn the sound off and not miss a thing. As Richard Franklin notes in the movie's DVD feature documentary, in the theater, sets are created using “flats” that slide on and off the stage. 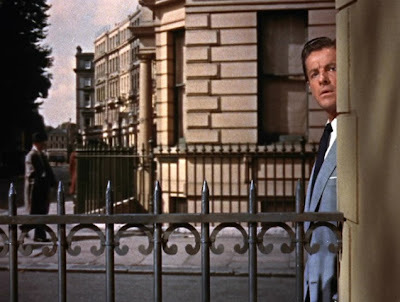 Hitch recreated that effect, often placing the characters around 2D props. For my thoughts on that unruly bed in the living room, go here. So much for the theatrical effects. Hitch went further, shooting the film from all sorts of dynamic, non-conventional angles, to compelling – but seldom gratuitous – effect. Check in with my next post. This post is amazing!!!! I love and this is my favorite Hitchcock movie. Thank you! 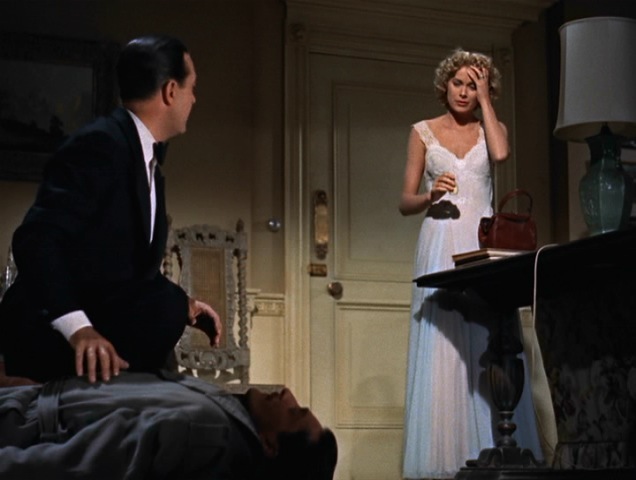 Dial M for Murder again is another fav - the theatrical points you make are interesting and true, I enjoy that style of movie. The curtains, yes I remember them so well! I have a boxed collection of Hitchcock movies which I haven't watched for a while, looking forward to choosing one for tonight. I love your site and the passion with which you write. Thanks for dropping by! We're discussing DIAL M on the Hitchcock Geek Facebook page. Love to see you join in.